My in-laws and some other family members were here from Italy for a month. Most days with my mother-in-law, we discussed what to make for lunch or dinner and talked about food in general. 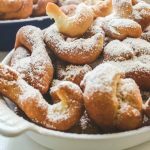 Just before Memorial Day, she decided to make these nocatole (Calabrian sweet fritters). She asked me that weekend if my husband was off the next day. I told her he was and she responded (in Italian, of course), “We will make a mezzo kilo (500 grams) of nocatole and un kilo (one kilo) of zeppole (a savory fritter).” I told her I definitely needed to get more flour and that she may as well wait to make it on Memorial Day since we were having friends over for a barbecue. Nocatole can also be called nacatole and nacatuli and they are a traditional recipe from Calabria in Italy. It is an ancient Calabrian recipe that originates in the province of Reggio Calabria and even other areas of Calabria. The ingredients used in Calabria to make these sweets are those usually produced locally: flour, eggs, olive oil and milk. Nocatole (nacatole or nacatuli) are fried and have the texture almost of a doughnut and have a delicate scent from the dash of cinnamon in the dough. I don’t know if the cinnamon is a typical addition to the recipe, but my mother-in-law likes to use. It could be something recent she started. She did get a large bottle of cinnamon the last time she visited us and maybe she feels she has to use it up some way? She never wastes a thing! Whatever the reason, the dash of cinnamon is really lovely in the dough. They are made in different shapes (braid rings, rings, rods and other shapes)and are made during holiday festivities. 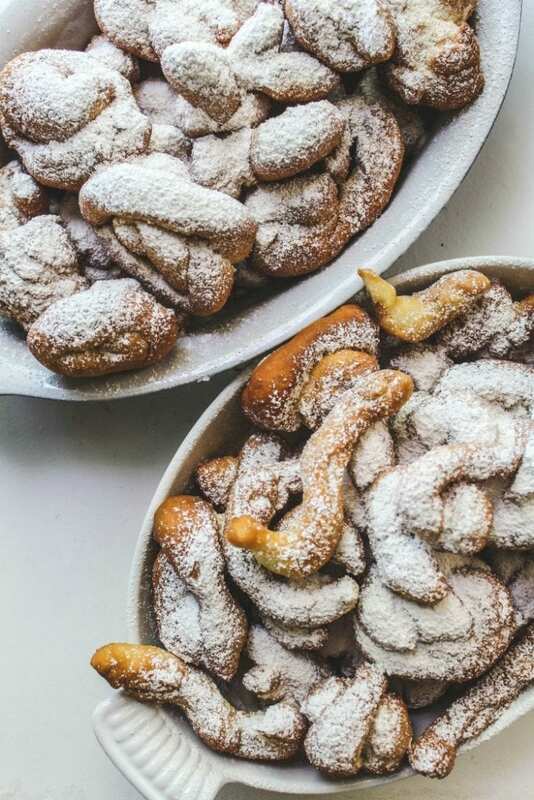 They are made in particular during the week before Easter, Christmas, Carnevale, and New Year’s Eve big dinner (cenone) and can be found in local bakeries in Calabria. You can find nonna’s in Calabria making these not only for special holidays. Nocatole can be enjoyed with local sweet wines in Calabria like vin santo. Now this is not a typical summer dessert in Italy. 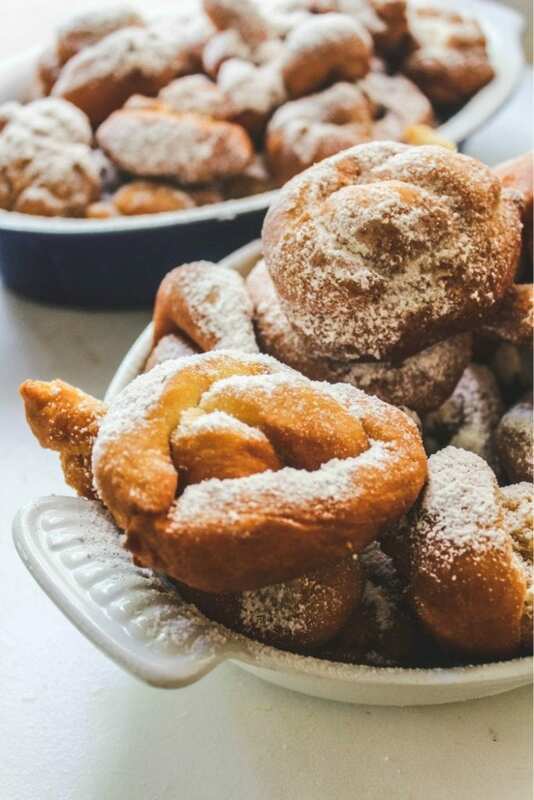 You are deep frying the dough, and in my humble opinion, they are best to be made on a much cooler day in December or in February during Carnevale time. But how could I say no to my mother-in-law! If you knew my mother-in-law, you would know, it’s not that easy to say no to her making something and making it her way (and I’m not complaining at all!). She’s already made a few things here for us and I make quite often her pan di Spagna recipe and her crostata agli amaretti. She got busy with my daughter making the dough and I was making sure she could find every thing she needed to get them frying. When they come to visit us, I pretty much give her free reign in my kitchen. And I know some of you might not agree with that. I have friends that tell me they couldn’t give up their kitchen, let alone live with their mother-in-law for a month. But you see, I learn so much by giving up the control of my kitchen. It’s not that I’m not still experimenting in it. When she cooks, I’m hovering next to her and helping along. It’s even come to the point in our relationship where she trusts me to make one of her beloved recipes with her supervising me. And there are some days when she is tired and she already cooked something fabulous for lunch, so I take over for dinner. So you see, it’s not total relinquishing of my own kitchen rights. There is so much more to gain than to lose by letting my mother-in-law feel at home in my kitchen. But on this hot end of May day, I was having a hard time dealing with the smell of frying dough. I had to open the windows to get out some of the smell and I had to close the doors from the kitchen to the rest of the house, so needless to say, it was a hot mess in my kitchen! I’m not that much into fried foods, because fried foods don’t like me very much. Teresa’s hands were zipping around so quickly. I tried to get some action shots and wish I had video taped it instead. She’s not very fond of me taking photos or asking her questions while she’s baking or cooking. She has to really be in the mood to want to share something with me. And God forbid I ask her twice for a recipe she’s already given me. Let’s say I lost my notes or wanted to double check the dosing and am asking her once more for the ingredients. That’s when she says, “You’re asking me again for THIS recipe? I already gave it to you last summer. Look at your notes.” How am I supposed to create a little cookbook with her treasured recipes if she isn’t fully cooperative? Thank goodness on this day one May in very hot Florida she was cooperative and I could share this recipe with all of you. With another month of #TwelveLoaves upon us, I thought these fritters fit perfectly with our theme of A Little Something Sweet. Is a fritter considered a sweet bread? This is a dough that is made with baking powder instead of yeast and they’re fried like doughnuts. A while back, I saw that doughnuts are considered quick breads. You can read about it more here and maybe get inspired to bake something to share along with us! 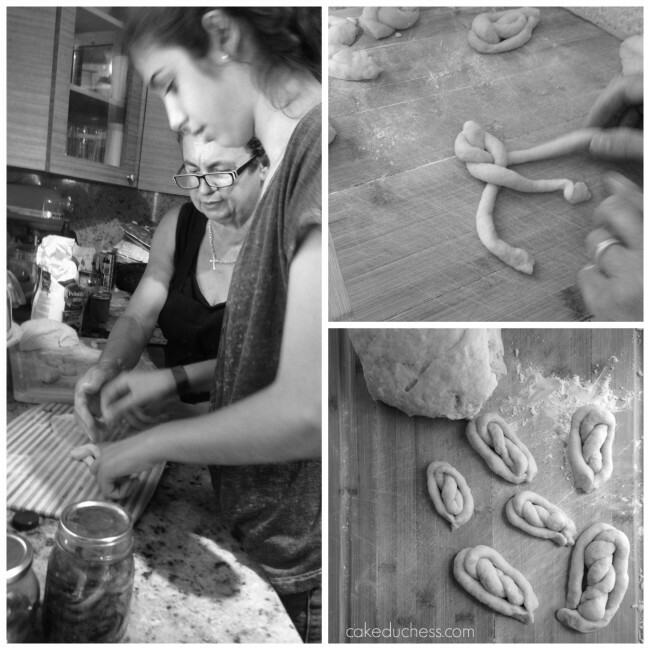 #TwelveLoaves is a monthly bread baking party created by Lora from Savoring Italy and runs smoothly with the help of Heather of girlichef, and the rest of our fabulous bakers. some notes on this recipe: This is the sort of recipe my mother-in-law has been making since she was a little girl. As I mention above, they make it for special occasions, but not just on special occasions. My kids consider them a doughnut. Since it has a dash of cinnamon in the dough and they’re tossed in confectioner’s sugar once they’re drained, they are pretty much like a doughnut. I’m sharing her basic formula for nocatole and she emphasizes that while she was baking here, the flour is different and she always had to add a little more liquid to the recipes. She makes mostly every thing on the counter with her hands. I do prefer to use my stand mixer, but for this recipe, I’m sharing it as she makes it. It’s not that hard to get the dough together and it’s actually quite cool to figure out with your hands if it is needing a little more liquid (in this case, milk is what she uses as liquid). I have seen other versions of this dough and it is made with yeast and also some use red wine in the dough. Since it’s made all over Reggio Calabria in Italy, there could be different provinces that have different versions. She was making them to entertain us and her family that was visiting us in Florida one hot summer day. But this is perfect for Christmas or any other special occasion. I think it made about 2 dozen of the fritters. It depends on how big you make each fritter. The recipe could make even more. This is my Italian mother-in-law's very special recipe. 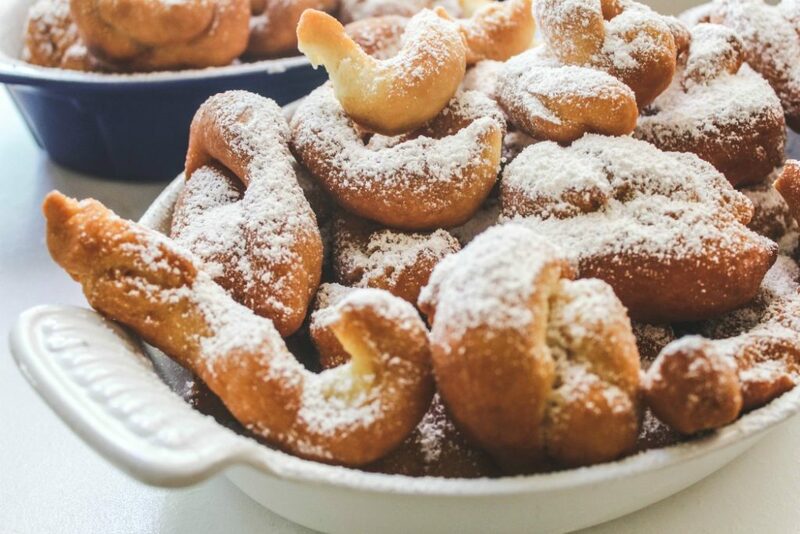 It is a typical sweet fried dough from Calabria, Italy that is sprinkled with confectioner's sugar. Italian donuts that are enjoyed on special occasions or just because! Place the flour on clean working surface. Add the baking powder to the flour and mix it around quickly with your hands. Make a well in the middle of the flour and add the sugar, eggs, extra-virgin olive oil, liqueur, cinnamon. Stir the ingredients together. Add the milk, starting with a tablespoon. If dough needs more, add a tablespoon more at a time. Knead the dough until it is soft and smooth. Take the dough and remove small pieces (about 100 grams of dough each piece)and roll into a log. Take the log and break into 2 pieces. Twist dough down like a rope and 1/2 way down the rope, grab two ends and wrap around the top. Press ends together gently so it won't open up.You could also make simple ring shapes. Fry the dough in hot vegetable oil. Turn the nocatole so they're a dark golden color on both sides. Carefully remove the nocatole and drain on paper towel lined plates. Toss the fritters in confectioner's sugar and serve. These were my favorite as kid growing up in Calabria never thought to find the recipe my mother didn't use recipe it was all in her head. Thanks for publishing this recipe.